The truth gets lost in the ups and downs of the daily headlines. Not as much changes in politics as observers often assert. 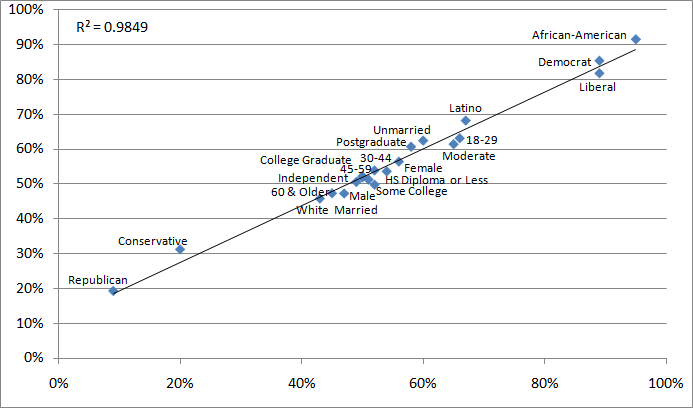 If you doubt this, take a look at the chart (below) comparing President Obama’s showing among various subgroups (gender, race, age, etc.) on election day 2008 with the average Obama job approval ratings in the Gallup poll for the same subgroups during his actual presidency. The stability is stunning. The correlation (R squared) is extremely high (.985), and on the accompanying scatterplot, almost all the data hug the straight line (which represents the expected values for an absolutely perfect correlation). Of late, President Obama has slipped with most groups as his overall approval rating has taken a nosedive from the 53% of the 2008 election to 43% in the latest Gallup survey. Even so, the shifts tend to be regular. For example, Obama is less popular with both men and women today than in 2008, when he received 56% of the female vote and 49% of the male vote in the election (a 7% gender gap). Yet note that, as of the latest Gallup sampling (August 22), there is still an identical 7% difference between the sexes, with 46% of women and 39% of men giving Obama a positive job approval rating.